Download The Darkest Hour in Digital HD from the iTunes store. 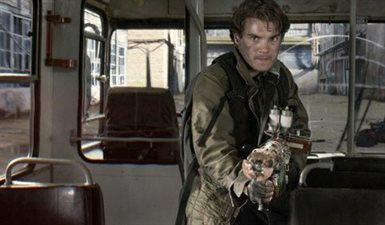 The Darkest Hour images are © Summit Entertainment. All Rights Reserved. 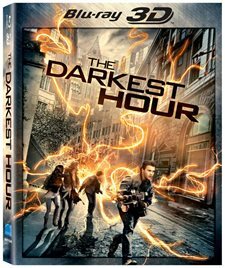 During the time of year that normally plays only to Oscar contenders, Summit Entertainment bucked the trend and released the Sci-fi thriller, The Darkest Hour, now this April, It is released to the home entertainment market on Blu-ray 3D. The film follows a group of five, 20-year olds (Emile Hirsch, Olivia Thirlby, Rachael Taylor, Joel Kinnaman, Max Minghella) in Russia who, through various circumstances, meet at a nightclub in Moscow during an alien invasion which left the city in complete darkness. After a near miss with death, the five decide to band together to try to stay alive and survive long enough to make it out of the city. While not given the huge Hollywood budget, a summer tent-poll, alien invasion film would have first-time Director, Chris Gorak, doing the best he can with what he has, and making the most out of every shot. The film's young cast does an exceptional job of acting in the film -- truly setting the audience in a world where there is an attack by an invisible alien race. However, acting, and directing can do only so much with this dismal screenplay by Jon Spaihts (Prometheus, Universal's Mummy Reboot). The dialog is extremely wooden, and the pacing of scenes is extremely incoherent. It is almost as Spaihts wanted to use this screenplay as a jumping point to get to do better scripts in Tinsel Town. One area that The Darkest Hour truly shines through is its 3D presentation. Producer Timur Bekmambetov (Wanted, Abraham Lincoln: Vampire Hunter) knows his audience wants true 3D, not post production; and he delivers in a big way. The depth conveyed by the 3D camera puts you right in the heart of the action. The audience truly feels like they are trapped in the rumble of Moscow with the survivors. While most films that are 3D have muted color, the film makers went out of their way to ensure that the 3D process did not harm the video presentation. The single disc Blu-ray contains the usual commentary track, deleted scenes, and "making of. 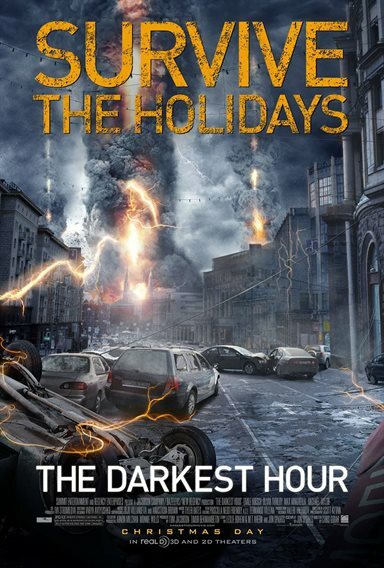 However, The Darkest Hour also provides a short film, entitled, "Survivors", a simple, short story that provides closure to the events that have taken place in the feature film. While the darkest hour will never be considered a "must have" for science fiction lovers, it sets out what it intended to do -- keep you entertained for an hour and a half, and forget the troubles of the world. The Darkest Hour images © Summit Entertainment. All Rights Reserved.